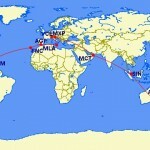 I’ve travelled quite a bit in my time, but never actually travelled around the world in one direction until 2013. 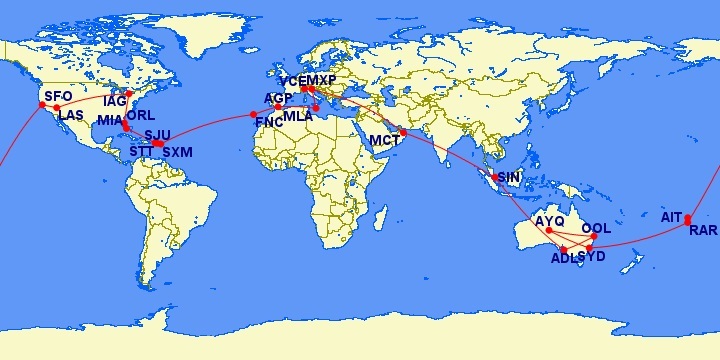 I combined and 18 night trans-Atlantic cruise with several one way air tickets to cook up a very interesting 7 week long RTW itinerary – even if I do say so myself! We started our long journey by flying from Muscat to Milan Malpensa on Qatar Airways then travelled by train to our first stop – Venice. Venice is such a unique and beautiful city. I love the panorama as you walk out of the train station. I’d booked a simple but convenient hotel, the Dolomiti, because it was just a short walk from the train station. After checking in we enjoyed strolling around Venice and in the evening did the obligatory gondola ride, much to the delight of Zawadi and the children. Next morning we walked all the way to St Mark’s Square (with a little help from the GPS), then journeyed back by water taxi. In the afternoon it was off to the harbour to board our home for the next 18 nights – the cruise ship MSC Divina. We soon settled in to our balcony cabin #13103, unpacked and were ready to enjoy our cruise all the way to Miami. I had intentionally booked a cabin on the port side of the ship so that we could enjoy the view of St Mark’s from our balcony as we sailed out of Venice. And what a beautiful view it was. The cruise was really a treat. Amani and Malaika loved the Kids Club and spent a few hours there most days, leaving Zawadi and I with some time to relax and enjoy each other’s company. Aboard they served a buffet breakfast and lunch, but in the evening we usually went to the Black Crab restaurant to enjoy a 5 course dinner. The first port of call on the cruise was Valletta, Malta where we visited the Hypogeum. It was very interesting. Next stop was Malaga in the south of Spain where we took a guided walking tour around the old city. A couple of days later we were in Funchal on the Portuguese island of Madeira in the Azores. I had booked a taxi for the day for a private tour. The island is beautiful and very rugged, being volcanic in origin. The highlight of the stop was the ‘tobogan Madeira style’ – a cane bench on wooden skis that is steered downhill by two guides, on the bitumen roads. What a blast! After a few days at sea crossing the Atlantic, relaxing, eating, drinking, reading on my Kindle, and watching flying fish pass by, we reached the Caribbean and sailed past the island of St Bart (I probably should visit it one day, being my namesake and all) and docked at St Maarten. I had booked a private tour there also, the highlight of which was definitely Maho beach, where aircraft fly very low over the sand due to the beach’s proximity to the airport. Most likely you’ve seen a video clip at some stage as it’s a popular tourist spot. We had a nice swim while watching planes land and depart, then had lunch at a nearby restaurant where a live band played reggae music. Irie mon! The next day we stopped in the US Virgin Islands where we had to clear US immigration, which took half the day, so we didn’t get to see very much. The final port of call the following day was San Juan, Puerto Rica. We didn’t do too much there either unfortunately as Amani was unwell with a fever (which the rest of us came down with in the following days). Strolling around the port area and visiting the old fort was nice though. We arrived in Miami to much fanfare and media attention as it was the first time the MSC Divina had visited the USA. After staying in Miami for a couple of nights we picked up our hire car and drove up to Orlando, to visit Disney World and Universal Studios. Next we flew up to New York state to visit Niagara Falls. It was cold and snowing there and we didn’t have much in the way of winter clothes since we had tried to pack lightly – with so many flights in our itinerary I wanted to avoid excess baggage charges as much as possible! It was good to see The Falls by both day and night. After successfully making our way back to Buffalo airport, we set off by air to Las Vegas. I booked a stretch limo to meet us at the airport and take us to our hotel for the first night, the Luxor. What better way to arrive! We enjoyed strolling around the hotel for the rest of the evening and then the kids had a great time checking-out the in-room jacuzzi bath. Next morning at Zawadi’s insistence we breakfasted at iHop (it’s her favourite fast food place in American) then moved to our fountain view room at the Bellagio hotel. The hotel was a bit pricey, but worth it – the musical fountains are wonderful. Come sunset we did a short Las Vegas Strip helicopter flight and enjoyed the lights, sights and sounds of Vegas. One of the most beautiful cities in the world by night. San Francisco was our next stop. We stayed at Fisherman’s Wharf, strolled up to Lombard Street, ate clam chowder served in a fresh bread roll and enjoyed the atmosphere. On our second day in San Fran we hired bikes and rode about 16kms from Fisherman’s Wharf, over the Golden Gate Bridge to Sausalito. It was awesome! Had a lovely lunch in Sausalito then caught the ferry back. After days of being busy, busy, busy, I had planned a nice quiet rest in the beautiful Cook Islands. We stayed in Rarotonga for a night and then flew on to Aituaki, which has to be one of THE most beautiful islands in the world. We snorkelled with giant trevally in the lagoon and visited One-Foot island – arguably the jewel in the crown of Aitutaki. Next stop was Sydney Australia, followed by Uluru (Ayer’s Rock) and Kata Tjuta where we managed 2 different treks thanks to the cool weather. Ayers Rock and the Olgas are such remarkable places – I never tire of visiting them. The Gold Coast in Queensland was next. Much fun was had at Sea World, Movie World and Wet ‘n Wild. Then on to Adelaide to catch up with some family. The final stop on our very long journey was Singapore, where we spoiled ourselves a bit by staying at the Marina Bay Sands, with its amazing and enormous rooftop infinity pool.